The start of my shop came from needing to make a handle for a tool I was making. I wanted to make this handle unique to me so I found myself at a exotic wood store and I found a want for a wood lathe. A short time later a wood lathe found its way home along with some pen blanks and parts to make a pen... it was all fun from there. I have found that I love the way each material is a waiting game. You never know what the end result is until you are complete. Finding this hobby became quite expensive so I started an Etsy store where I can share my creations with others and I am able to put ALL of my funds back into new materials to make more pens (in it for fun and not a business). Ask any magician what his favorite part of doing magic tricks and they will tell you "I love to see the faces and reactions of people when I finish a trick" and I will tell you the same thing when I hand someone a pen I made. Faces light right up, they smile, and I receive some of the most amazing compliments. That is my favorite reward of all. I absolutely love Bob Ross and Fred Rogers, they are unique and loved doing what they did. Bob Ross loved to take a blank canvas and turn it into something that will just amaze any human and Mr Rogers was able to take ordinary things and turn them into fun. I don't want to forget the man at the wood store the day I was buying my lathe. I unfortunately can't remember his name but he brought the pens he made into the store to show me the possibilities and they were beautiful and I wanted to recreate that. I originally started my Etsy store name as Turned Knotty Exotic Pens but I found it was quite the tongue twister. I liked the name Turned as I turned things on a lathe and Knotty as wood sometimes has knots in it but it just wasn't catchy enough for me. I had been using the name for 5 years and wanted a short, fast and impactful name. 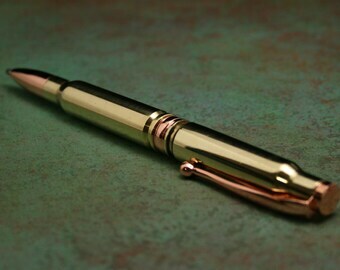 People had been just amazed at the bullet pens I had been making as well as the pens that replicate bullets. Something short and sweet came to me, 2A. 2a represents bullets, guns, hunting, outdoors, conservation, living, family, good times, camping, and active lifestyles. I was nervous as I felt people were going to take a political side and I would be blackballed from buyers from using such a name. I took that chance and it was more accepted than the Turned Knotty name was... EVERYONE LOVED IT and nobody in my circle ever took it as a political jab or anything as such. Being the creative person I am, I created an impactful logo that stood out; something that I had trouble doing with the old name. With that, 2018 was probably the biggest change I have made to this store. One other thing I was feeling needed a slight change was not only having an impactful logo and name, when people opened the envelope I wanted just a bit more of impact and suspense just before the reveal (like magicians). I was originally just putting my pens in an velvet pouch, sliding it in a small bag and then into an envelope and sending it off. When people opened the envelope they found a pen in a bag... it was an amazing pen but it was in a bag. 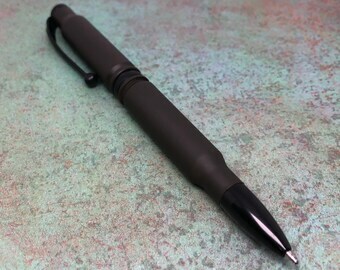 I decided that my pens will now come in a black 2a branded gift box so it can not only be easily wrapped but it was one more step to the reveal of their new writing utensil. I handed a friend her new pen just after I started doing this and she said "Wow thats amazing" and she hadn't even pulled the pen out of the velvet pouch yet. The impact and suspense just before the reveal matched what I was aiming for. Aside from the bullet pens, all of my items are 'What You See Is What You Get' as I do not mass produce my designs nor do I have any "made to order" items. I try and take pictures to allow you to get the best interpretation as to what you will be purchasing.